New book, 82 pages, 50 period photos, 51 colour profiles. Covers aerial operations by both Finnish and Russian Forces during the Continuation War between 25th June 1941 to 10th September 1944. 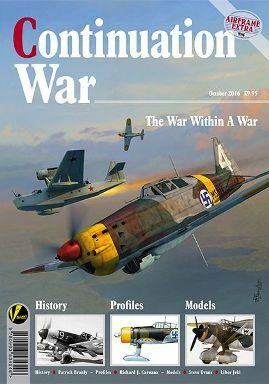 Contents: Historical narrative by Patrick Branly, Numerous period images, Colour profiles by Richard J Caruana, Specially commissioned kit builds: 1/32nd Special Hobby Brewster Model B239, 1/48th Eduard/Gavia Westland Lysander, 1/72nd Zvezda Ilyushin Il-4 by Steve A. Evans, 1/72nd Hasegawa Brewster Model 239, 1/72nd ICM Polikarpov I-153 by Libor Jekl.